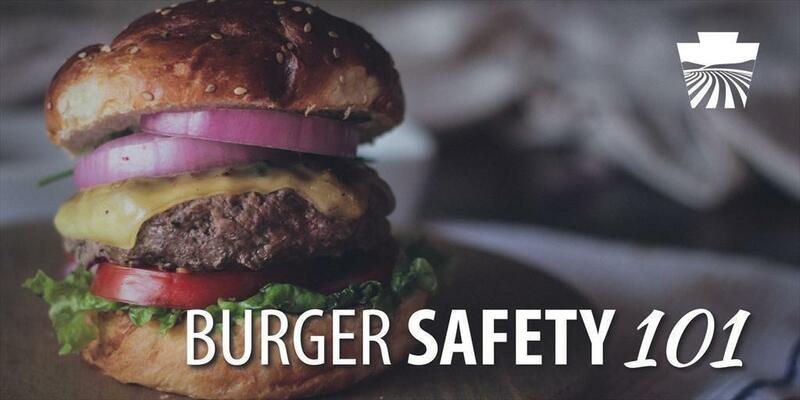 ​Memorial Day weekend, Beef Month and National Burger Day – the perfect recipe of events, for a lesson in burger safety! In our environment bacteria are everywhere--virtually any food can harbor it. Commonly, the E. coli bacterium is of special concern in ground beef. Certain strains of the bacteria are known to colonize in the intestines of animal, which could contaminate muscle meat when the animal is butchered. E. coli bacteria survive both refrigerator and freezer temperatures, and once they get in food they can multiply slowly at temperatures as low as 44°F. The bacteria are killed by thorough cooking, which for ground beef is an internal temperature of 160°F as measured by a food thermometer. USDA recommends not eating or tasting raw or undercooked ground beef. To be sure all bacteria are destroyed, cook meat loaf, meatballs and hamburgers to a safe minimum internal temperature of 160°F. When meat is ground, more of the meat is exposed to the harmful bacteria. Bacteria multiply rapidly in the “Danger Zone” – the temperatures between 40°F and 140°F. Refrigerate or freeze ground beef as soon as possible after purchase; this preserves freshness and slows the growth of bacteria. It can be refrigerated or frozen in its original packaging. Store ground beef at 40°F or below and use within two days, or freeze. Never leave ground beef, or any perishable food item, out at room temperature for more than two hours. Clean – wash hands and surfaces often. Unless you wash your hands, utensils and surfaces the right way, you could spread bacteria to your food and your family. Separate – don’t cross-contaminate. Even after you’ve cleaned your hands and surfaces thoroughly, raw ground meat can still spread illness-causing bacteria to ready-to-eat foods unless you keep them separate. Cook – always cook to the right temperature, and avoid your food temperatures being in the Danger Zone! Chill – refrigerate promptly. Illness-causing bacteria can grow in perishable foods within two hours. Forgetting these simple food safety tips can be a recipe for disaster – this grilling season​, keep yourself, your family and your friends food-borne illness free!